With Spring finally here, whether you're prepping your motorcycle for the riding season, or you never stopped riding it, this would be a good time to inspect your first aid kit and replace, replenish or supplement (hint: "sting kills") as needed. Reorganizing and re-familiarizing yourself with the kit could also prevent Emergency Step #1 being "dump the entire contents onto the ground and begin fishing around." Wait, you DO keep a first aid kit on your bike, right? If not, you should. 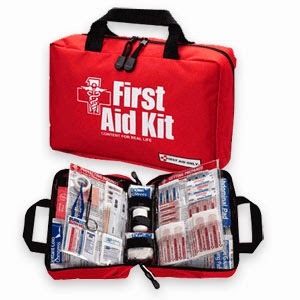 A first aid kit is similar to an umbrella -- you'll only need it when you don't have it.